As the English, Spanish and Dutch began to explore and claim parts of North America, Jacques Cartier began the French colonization of North American in 1534. By the 1720’s the colonies of Canada, Acadia, Hudson Bay, Newfoundland and Louisiana that made up New France were well established. In 1750 the village of Kaskaskia counted over 1,000 French residents. 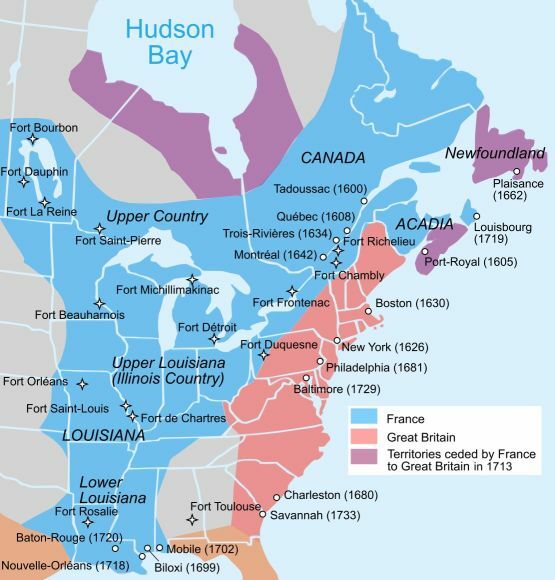 The British triumph in 1763 over the French in the North American theater of the Seven Year’s War ended the French dream of dominating North America. The French and Indian War left the French residents of Lower and Upper Louisiana (which included Illinois) with a tough choice: submit to British rule or cross into Spanish territory on the west side of the Mississippi and rebuild their lives there. While many French people moved across the river and built the towns of Ste. Genevieve and St. Louis in Missouri, evidence of the time of the French in Illinois is seen now in the French names of these early river towns in southwestern Illinois and in the French names on the tombstones in those town’s old cemeteries.